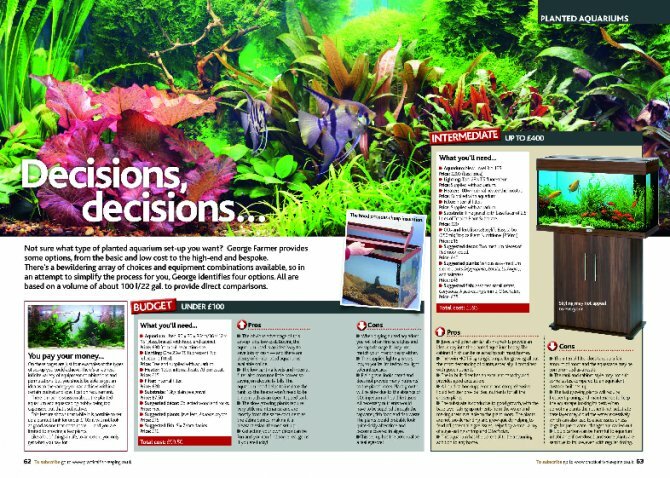 In the July issue of Practical Fishkeeping, George Farmer looks at four planted aquarium options, from the basic to the bespoke. Not sure what type of planted aquarium set-up you want? There's a bewildering array of choices and equipment combinations available, so in an attempt to simplify the process for you, George identifies four options, all based on a volume of around 100 l/22 gal. to provide direct comparisons. He takes a look at what's involved in each set-up, pros and cons, and the total price you could expect to pay for something similar. So if you're looking to set up a planted tank, don't miss the July issue of PFK.